While watching Paul Thomas Anderson’s The Master, one thought kept running through my mind: “I don’t think I’ve ever seen anything quite like this.” Visually stunning and filled with disquietude, The Master can be as staggering as it is demanding. When I say that The Master brims with unease, I mean it as high praise. The composition of its images, its almost frightening insularity and the strangeness of its central performances are nothing short of mesmerizing. 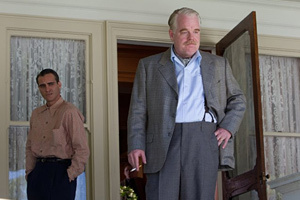 The movie centers of two characters, a sailor cast adrift in society after World War II (Joaquin Phoenix) and the founder (Philip Seymour Hoffman) of a cult called The Cause, which claims to take adherents back through past lives as a means of helping them attain perfection. Untamed, libidinous and violent, Phoenix’s Freddie Quell becomes a kind of project for Hoffman’s Lancaster Dodd, a test case for Dodd’s therapeutic methods. Theirs is a complex relationship built on contradictory helpings of acceptance and scorn. With his mouth twisted into a perpetual snarl and his shoulders hunched forward, Phoenix creates a character who suggests both menace and vulnerability. Hoffman’s Dodd has an air of assumed grandeur. Dodd seems totally convinced of his own importance and singularly focused on his theories, which (as his son reveals in a moment of rebellious candor) the great man may be inventing on the fly. Prone to violent, alcohol-fueled outbursts, Freddie may not be entirely likable, but Dodd isn’t entirely dislikable, either. That’s part of the way in which Anderson keeps us off guard. War scarred and psychologically troubled, Freddie clearly needs help with destructive behavior that includes making potent alcoholic drinks out of any available substance, including paint thinner. For his part, Dodd can’t seem to bring himself to kick poor Freddie to the curb. Anderson slowly lets us know that Dodd is gathering followers, many of them wealthy people who eagerly submit to what he calls “processing.” He drubs such followers with provocative questions, repeating each inquiry with willful insistence. Such “processing” is supposed to help people recall and recover from troubling life episodes, roadblocks on the path to perfection. Anderson insists on keeping the thematic waters muddy, even when his images — with help from cinematographer Mihai Malaimare Jr. — are astonishingly vivid, many of them set to the startling rhythms of Jonny Greenwood’s invigorating score. The Master may bother some viewers because it poses unanswered question. Why is Freddie so troubled, for example? He ran away from love he found in his hometown of Lynn, Mass. He probably saw too much war. He claims to have had an incestuous relationship with an aunt. But we’re never entirely certain about the forces that keep pushing Freddie into the darkest corners of his mind. Dodd has been compared to Scientology Founder L. Ron Hubbard, but a movie about the roots of Scientology will have to wait. Anderson has created a haunting vision of the post-war 1950s. Meticulously appointed and yet never entirely realistic, The Master lives in a world fraught with unborn meanings and still-to-be-realized consequences. Whatever you think of Dodd, you’ll have to agree that he has no greater supporter than his wife, played with astringent force by a terrific Amy Adams. As Mrs. Dodd — one in a succession of Mrs. Dodds — Adams exhibits frightening levels of loyalty and determination. She’s like the ideal corporate wife, well-mannered, attractive, maternal and totally committed to her husband’s advancement, a true believer when it comes to The Cause. Taken together, Phoenix, Hoffman and Adams give three of the year’s most commanding performances. After Anderson’s last movie — There Will Be Blood — I had an e-mail exchange with a screenwriter who found the movie lacking because it had no third act. The same can be said of The Master. But Anderson is too skilled for us to assume that he doesn’t know how to create a third act. Absent a thunderous payoff, we’re left to turn the movie over in our minds, tilling its rich soil as we search for seeds of meaning, wondering whether every image we’ve seen is meant to be taken literally. Some may be a product of Freddie’s lurid imagination, for example. Movies, of course, are meant to be experienced as much as pondered. And the experience of The Master can be unsettling and uncontainable, as overpowering of some of Anderson’s extreme close-ups. If you’re with The Master, it may make you feel as if you’re standing on the edge of a cliff, fearful of the fall but unable to turn away. The Master can trouble as much as it intrigues, but it also stands as a boldly uncommon piece of cinema.